I was born with albinism, which caused me to be legally blind. Due to my lack of sight, I live in a world where bugs don’t exist, dust is something I only hear about but never see and everyone has flawless skin. Aren’t we living in exciting times? I sometimes wonder what our ancestors would think if they could be here in this moment. Who would have thought we’d ever be untethered to a phone line? Or have the ability to connect with someone from around the world instantaneously? Heck, even receiving news almost as soon as it happens is almost miraculous in comparison with days gone by. As an advocate, one of the things that really excites me is being here to see representation unfold. Just thinking about the logistics of tracking the numerous groups of people gives me heartburn. Can you imagine the group breakdowns? It’s enough to make your head spin. Being one of the 15% of the world’s population who has a disability, seeing more representation is so empowering. When you have an online presence it’s even more so because you can meet so many more awesome people. 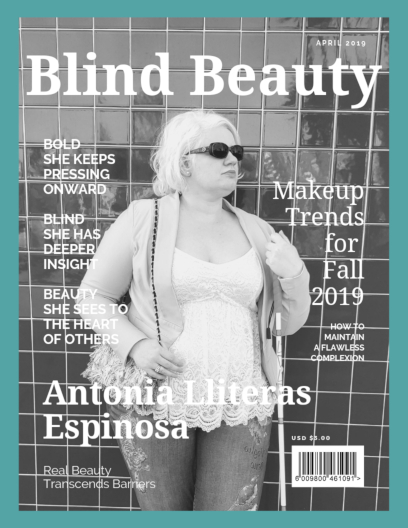 Take today’s Blind Beauty, Antonia, for example. Prior to last week, I didn’t know this young woman. Yet thanks to Instagram, when I asked if I could share one of her posts, well, the rest is history. Out of sight out of mind, right? I have been asked many times if there was a cure whether I would take it and, to be honest, I don’t think I would. It has taken me many years to get to where I am today, but I have learned to find joy through my other senses. I appreciate the beauty in the world just as much as the next person and my visual impairment has put me in a unique position where I get to experience the raw humanity that unites us all. I get to see people at their best because I am so vulnerable to others. If I were to suddenly gain my sight, I would miss out on all this and, let’s be honest, the world would be a much dirtier place! white/blonde stylish bob hairstyle. Her cami is white with a light blue jacket, blue jeans, and sparkling silver sneakers. Her white cane also has a bright pink handle. This photo shows Antonia sitting on a park bench. She’s wearing a vibrant royal blue top with a luxe velvet navy jacket with jeans and black flats. Her white cane is propped up against the bench. In the background parked vehicles and storefronts can be seen. Thank you for this feature! You are incredible and I love reading your blog.